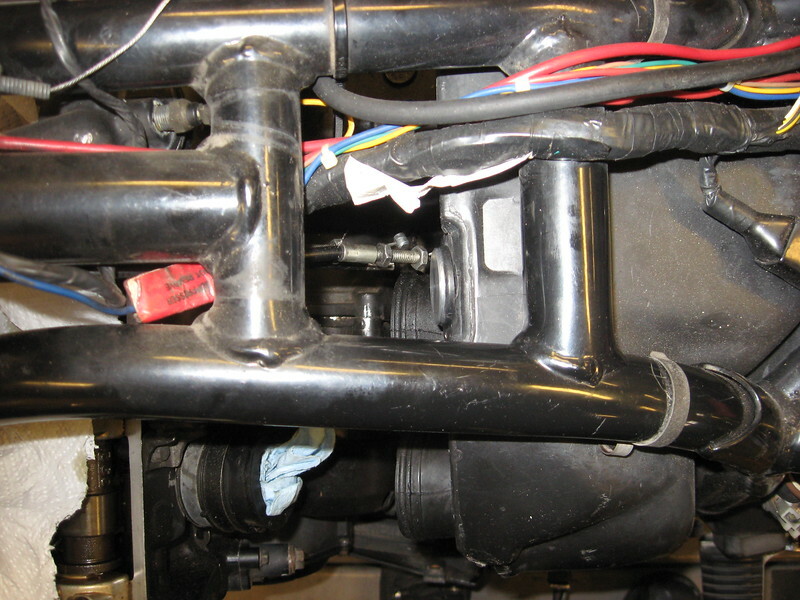 If the air ports are tapped and plugged securely, why not make the block-off plate so that it lays in the recess of the valve cover where the reed valves were and flush with the top? A couple of the reasons I've heard to install block-off plates is that it cleans up the area and makes it easier to remove the cover. The plate could be held in with high temp adhesive of some sort. With the current setup I have, you still end up taking those four bolts out to get max clearance to remove that pesky valve cover. It would be more difficult to go back to stock, but it would give the most clearance come valve check time and also the cleanest look. Appreciate the suggestion. I actually considered that, but decided on the full cover plates instead. One of the reasons for going with the button head screws is because of their low profile. Whether they'll be low enough without removal? Guess we'll find out. If not, we'll see how much they interfere. I do have a little extra material so I can counterbore the holes slightly if need be. And finally, my grousing about a local metals distributor no longer selling drops - no longer an elevated blood pressure issue for me. Found out from a local biker friend (actually the fella I was doing the BSA crank work for, and making some bits for his drill mill), that a Metal Supermarkets (https://www.metalsupermarkets.com/richmond-virginia/) store is in town that specializes in material small quantities. The place is right around the corner from where I (and MOB later) used to work, altho' they weren't around when I was there. MOB may have already known about the place - dunno. If he did, he didn't say anything. Bud, that gives me an idea (A project) for connieklr to consider..
Why not machine away the lip of the 2 ports before installing his covers?? That sounds like a plan! It's almost as much fun as spending someone else's money! Heck, IF I was going to go to that extreme, I'd machine off the lips of the ports, the flange areas of my pieces turning them into "slugs," and just weld those suckers up. And yes, that is what I am finding. 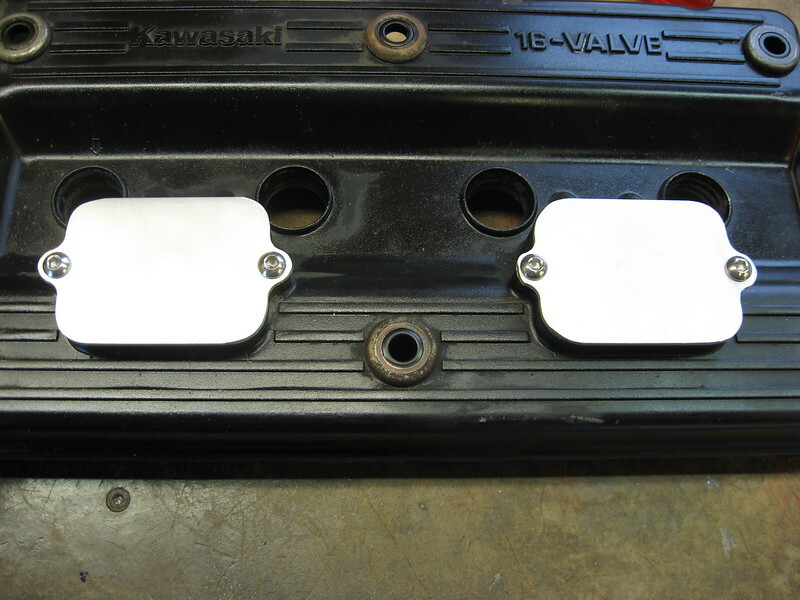 Even with the button head screws, I still had to remove the LH block off plate I made to get the valve cover in place. ~2.5mm seems to make all the difference in the world, as are the hollow dowels, which I pulled out of the cover for additional clearance. They have always been a PITA on my bike. 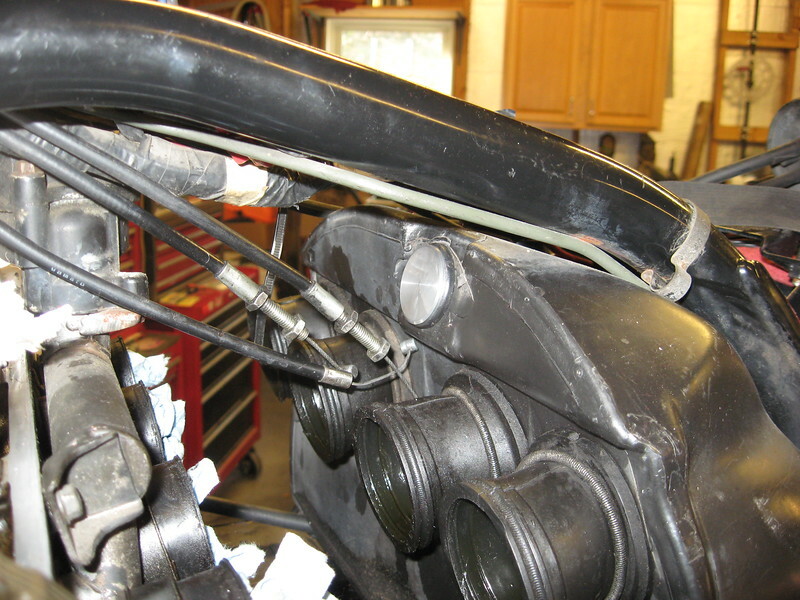 The RH side cover can compress the coolant line. so it's really not a factor. I'll play with this thing later, but time to shift gears. The HD croaked on my garage computer, new one just arrived, so it's game on for computer repair. That’s what I did, Bud - cut them out of some old aluminum scrap I had lying around, using a jig saw and then cleaned up using my dremel - sitting on the back step. Not super pretty, but with a quick shot of whatever black paint I had lying around, some gaskets made from a roll of material, and a few button-cap screws from the collection and other than time they were free. And I didn’t tap the head. That was thousands of miles ago and no leaks. It's more an Access thing... less clutter, less leaks, less hoses to fail, less oily air going hither and non. It does NOT reduce emissions. It's a 'feel good' thingie. Kinda like charging an Electric Car with juice from a Power Plant, letting forests burn in a 'No Logging Zone', having Kenworth's haul recycled Glass to a landfill or horrid Rubber hose factories making anti-Smog hoses. Let's agree to disagree...or not. Not only can you be considered as "slave labor," but also a freakin' instigator. After seeing that my skinny plates still were too high by an approx. 2.5mm for "easy" (Ha!!!) valve cover removal, I am seriously considering what you mentioned above - kinda, sorta. The mill and surrounding area has already been cleaned up, but thinking of pulling out the set screws, cleaning up the yukky aluminum with a die grinder, and just welding up the holes. 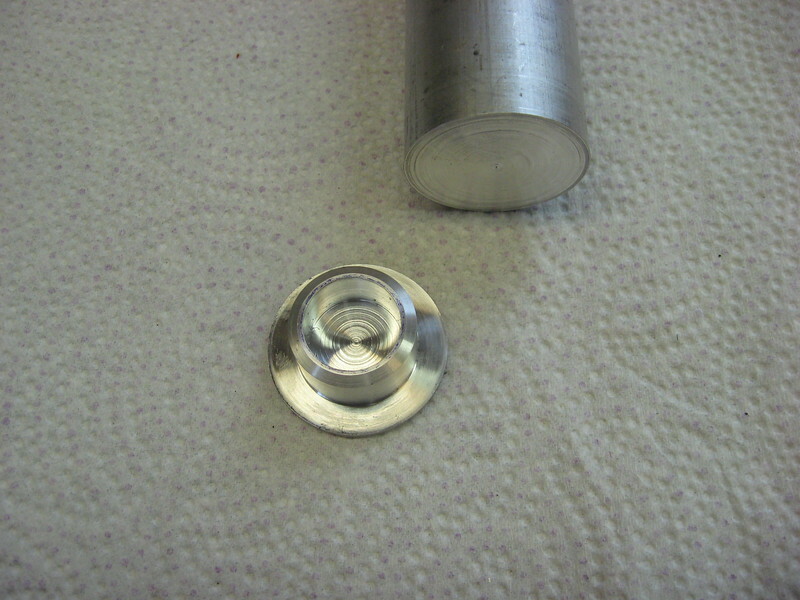 Once that's done, mill the cast lips around the reed area down to near the gasket surface then refit the plates I made. if I fook up - well - they're some out there that are relatively cheap. I'll flip a coin and go from there. On another note, new HD install seemed to go okay for the garage computer and I just need to install all the miscellaneous crap to make it fully usable for the stuff I do out there. why not use countersunk screws, even cleaner, and reduce some height? Like said, mines still on, i see no issues with it. one reason i did leave it on, is since it draws air from the airbox, it will, in theory, also put a slightly cooler charge in the exhaust pipe. considering the propensity of these bikes melting the fans, i don't see this as a bad possible side effect. has anybody tested the egt with and without the air valves plugged vs open on the same bike? That would have to be done while running down the road with a good load applied or on a dyno since no air is admitted into the exhaust until the intake manifold vacuum is low (open throttle). I'd say the EGT should be higher with the air valves contributing air into the exhaust system. On my bike, as mentioned, the screws weren't the issue; it was the cover plates themselves. 2.5mm seems to make all the difference in the world. I'll either have to resign myself to the fact that at least one of the covers still has to come off, or really reduce the height of the pocket areas by machining them down. I have to remove one screw to get my valve cover off. For some reason, that one (I think it is the leftmost one) just doesn't clear the frame. All the others do. Next time I remove the cover, I'm going to grind that screw down just enough to make it fit. I wuz just suggesting you remove the top lip (approx. 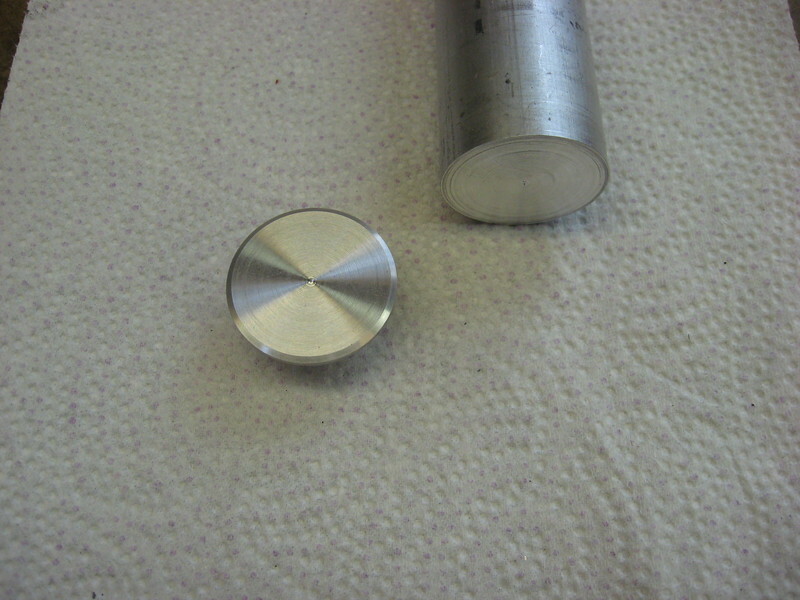 2.5MM) and install your plates. Not remove the whole thing and or weld it up. Hmmm, mebbe ya could use a fly cutter, remove the 2.5 mm lip, and shave the fins/etc too??? explain your theory here. pulling cooler air into the exhaust will make the temps go up.. exaclty how? the fuel shouldn't be combusting in the exhaust system, if it is, its popping. My theory is that there is some sort of chemical reaction that goes on in the exhaust system when fresh air is introduced that would make the temperature higher. I'd also say that there isn't very much raw fuel in the exhaust stream so the introduction of fresh air doesn't excite things to the level of creating a pop. But...I don't actually know if the temperature ends up being elevated or diminished. It's just an opinion and worth everything I was paid for offering it. ok, so upon reading up on it, (in particular, the yamaha ais system being similar) yes.. it causes oxidation in the system, causing heat as a result. i stand corrected. i always thought the extra heat from catalyzed systems was from the converter restriction (on those equipped with), not the air pump. but the air pump or air injection alone does cause it as well, like on the connie. Hm. Now i know. I made it over to the potential new source for my metal needs this morning, and they had exactly what I was looking for earlier. They had an ~18" x 9" x 1/4" drop that just barely squeezed into the aluminum pannier on my KLR. Price was just a tad over $15. We're happy. The folks are super nice too and they have a SL of stuff in their warehouse. I'll be back, but not today. I got what I needed for now. OK, what are ya building now?? Uh, spares. Yeah, that's the ticket, spares. I suppose this might be considered a little overkill for the plug where the airline came out of the air box, huh? Seriously, I looked in the box and a couple of hardware stores and couldn't find one that was the correct size with the grommet removed.... and duct tape just wasn't gonna cut it..... figured it'd come loose anyway. So, fire up the lathe and crank one out. Turned it so it is a firm fit, but secured it anyway with some Permatex Gasket Maker RTV. She ain't going no where. looks right to me. was thinking of that this morning, might do this in the spring when the weather warms up to reduce exhaust heat. was a welcome feeling this morning though on the way into work.